Want to WIN awesome prizes? Love books? Click HERE to join up with us! Just a reminder, it's not too late to sign up! Click the link above to see all the goodies that are currently up for grabs. We'd love to have you! Today we have another giveaway! Yes my friends, the awesome Stacey Wallace Benefiel stopped by yesterday with a guest post about her summertime recipe for delicious potato salad. Today she's here with a giveaway. Up for grabs is two entire trilogies of Zellie Wells! *Be a part of the summer challenge of course. * Fill out THIS FORM. 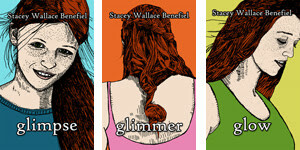 Then write a comment below telling Stacey why you simply must have one of these trilogy packs.